* Not really a requirement but a strong suggestion: if you are using the "cookie" authentication method, having the mcrypt PHP extension on your web server accelerates not only the login phase but every other action that you do in phpMyAdmin. Go to www.phpmyadmin.net to download the current version and to find further information. 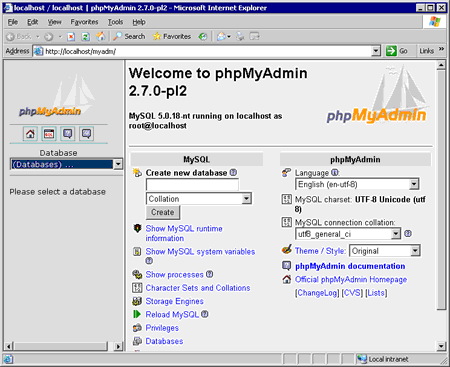 In January 2006, the current version was 2.7.0 (latest stable version) and the phpMyAdmin-2.7.0-pl2.zip archive could be downloaded from the download section. Unzip and copy the content of the archive to the web server. We created a new folder padmin (complete path: c:\inetpub\wwwroot\padmin). In the text editor open the config.default.php file and save it as config.inc.php (an editor highlighting the PHP sytax is an advantage). You can make the changes directly in the file config.default.php, but it is recommended that you first save the file as config.inc.php and edit the required values in this new main file. config.default.php is a template file, but can also work as a configuration file. In config.inc.php, only changed values can be entered, the others are taken from the config.default.php. $cfg['Servers']['auth_type'] = 'config'; // Authentication method (config, http or cookie based)? // Configuring the absolute path to the folder containing phpmyadmin. Usually the auto-detection is used which detects the path, and then there is no need to configure it. It must contain characters that are valid for a URL, and the path is * case sensitive on some Web servers, for example Unix-based servers. In most cases you can leave this variable empty, as the correct value will be detected automatically. However, we recommend that you do test to see that the auto-detection code works in your system. A good test is to browse a table, then edit a row and save it. There will be an error message if phpMyAdmin cannot auto-detect the correct value. // Disabling the warning about the "PmaAbsoluteUri" value not being set up. If it seems that everything works fine, you can change the value to "TRUE" or to add the previous "PmaAbsoluteUri" value. // Disable the default warning about $cfg['PmaAbsoluteUri'] not being set. You should use this if and ONLY if the PmaAbsoluteUri auto-detection works perfectly. // Defining the name or the IP address of the computer on which the MySQL server is administered. //Values specifying detailed setup of the server. We used the default settings without any changes made. // Defining the extension - whether the older mysql or the newer mysqli (in PHP 5+) should be used. //Disable the default warning that is displayed on the DB Details Structure page if any of the required Tables for the relationfeatures could not be found. // Authentication method (config, http or cookie based)? // User account used for logging in the database. //Password for the access to MySQL (required upon using the "config" authentication method). // Defining the secret password for encoding the password to cookie on your client server. It is entered only once and you are not required to enter that anymore. //The 'cookie' auth_type uses blowfish algorithm to encrypt the password. If at least one server configuration uses 'cookie' auth_type, enter here a passphrase that will be used by blowfish. $cfg['Servers'] vs. $cfg['Servers'][$i] - // [$i] or  have the same importance for identifying the values for the server. The $i value can be replaced by numbers 1,2,3.. and you can define to which configuration of the server this value should be affiliated. Detailed explanation of the configuration of the administration of mysql servers would be a topic for a new larger article. You can also read the documentation. "config.default.php" is moved to the "libraries" directory. "config.inc.php" is created through a web browser in the "scripts" and "setup.php" subdirectories. Many other improvements. My current problem with the error message "Call to undefined function: pma_generate_common_url()" seems to be the past.